Workspaces were set up with clear instructions that mirrored Bob’s presentation. Members tried their hands at enso. After explaining his own call and long practice of brush painting, Bob started talking about materials. He pulled the tools back to their essentials: rock, bark, soot, stick, animal fat, and animal hair. The paper is made from mulberry bark and used in its raw form, with no sizing. (Most of the commercial brush painting paper you buy is sized. Bob is a local source for unsized paper.) The ink stick is made of wood soot and animal fat. The brush is a stick with animal hair attached. All the basic tools are made from natural items. He paints on a felt pad of 100% wool; as students we used pads of about 30% wool. The wool content is needed to absorb moisture. 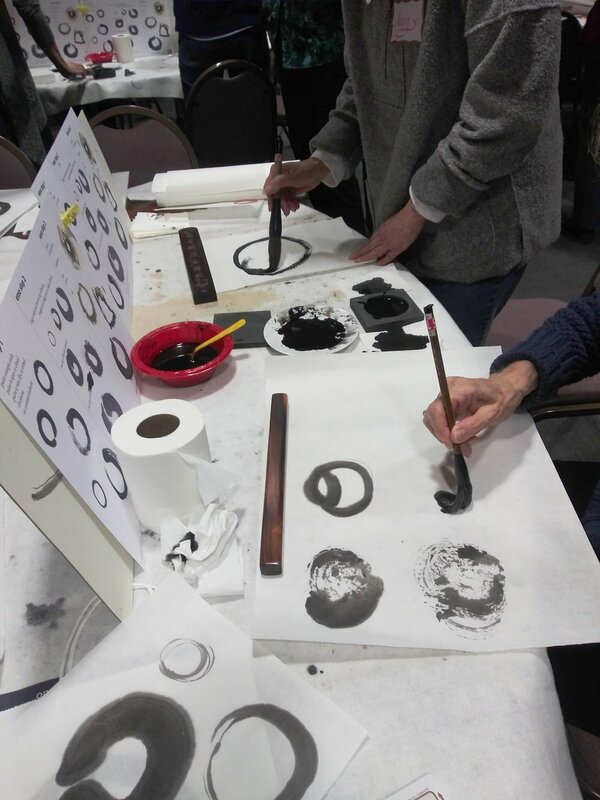 During the workshop, participants worked on a one-stroke enso. Enso is the Japanese word for circle. A single circle is full of infinite possibilities. In cultures around the world the circle stands for many different things; sun, moon, face, infinity, life, etc. I think it safe to say, none of the colleagues circles looked the same—perhaps similar, but not the same. Bob showed us samples of how he matches text to an enso, ensuring that both expressed the same spirit and/or meaning. The atmosphere buzzed with concentration and joy and each person took home at least four completed circles and some inky fingers. Gary Feyen creates “Mini Art in a Minit” at the Demo Corner. For those interested in learning more from Bob, contact him at Laughing Waters Studio in Minneapolis. Website: www.laughingwatersstudio.com or call him at 612-333-1881. Our time together was packed with inspiration, practice, and exercises to stretch every personality out of our comfort zones and into deeper learning. In this fascinating class with artist Gemma Black, students were led down the path of fully understanding and internalizing the details, nuances, and characteristics of pre-copperplate hands. “Looking Back to Looking Forward: Calligraphy - Its History, Its Mystery, Its Wonder”: a Program Presented by Gemma Black. In “Looking Back to Looking Forward” Gemma illuminated the fascinating history of calligraphy and other writing systems, from the early Egyptians to the 21st century. Read Marion Greene’s review of Diane von Arx’s weekend workshop covering design and layout for calligraphers April 22 and 23, 2017. Read Alex Glowka’s review of Diane von Arx’s presentation on design and layout for calligraphers at the April 2017 Colleagues of Calligraphy program. Georgia Greeley taught how to make a sculptural accordion book of her own design. February 2017 Workshop Review: Mini Workshops, Maxi Learning! November 2016 Program Review: Not Your Grandma’s Uncial! Read about Jean Formo's Monoline Uncial program that she presented to Colleagues of Calligraphy members in November 2016. Read about Julian Waters’ October 2016 workshop "Blackletter Variations: Fraktur and Textura."